Donald Trump trailed a "major statement" on Twitter today. The US President has just wrapped up his diplomatic tour of Asia, having visited countries like Japan, South Korea, and the Philippines. 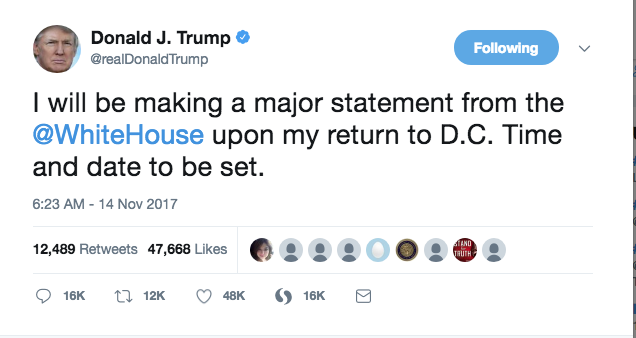 And now, he has teased he is due to make a "major statement" upon his return to the United States. Exactly what can be expected from the statement is currently unknown, with Trump making no further comment as to the content of the statement. The two-week trip has been branded by the President as "enormously successful." In the last stop on his tour, Trump appeared to be amused when the Filipino president, Rodrigo Duterte, described the national press as "spies." Duterte was repeated praised by the US President, and the duo appeared to be on first-name terms with Duterte even performing a love ballad for the US head of state.